Love Among the Robots: Students use logic to determine which members of the Robotics Club exchanged cards and what type of candy they shared on Valentine's Day. Famous Couple Match-Up: Build student background knowledge with this activity that requires students to match up famous couples in history and literature. While the students are cutting and matching, you can lead a discussion about each pair. Equivalent Fraction Match-Up: Students “repair” the broken hearts by matching equivalent fractions to bring the left and right pieces together. 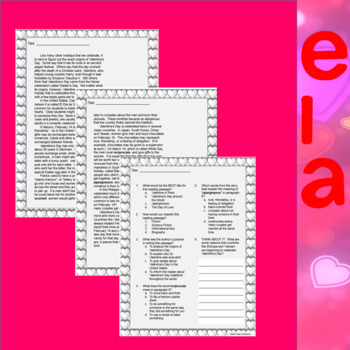 Valentine’s Day Make-a-Word: Challenge your students to use the letters in Valentine's Day to make as many words as possible. 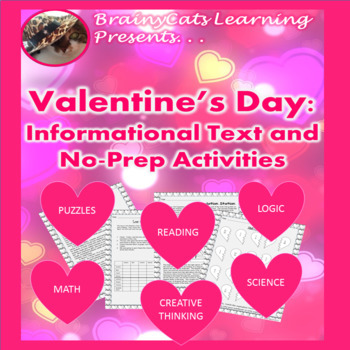 Informational Text: Valentine’s Day celebrations around the world. There are two versions of the text -- one with guided annotation and one without. The Language of Love: Students match different ways to say “I Love You” with the correct language. It’s Not Valentine’s Day: Students can stretch their creative muscles and enjoy a break from “mushy love stuff” by creating new celebrations for February 14. Circulation Station: Students read a paragraph about the process of circulation in the body and use the information given to label a diagram of the heart. Heart and Blood Word Search: Students search the grid for words related to the heart and blood. Expository Prompt and Writing Activities: Students are guided through analyzing a writing prompt and creating a controlling idea. An editing sheet is also provided to help students check their writing for common errors. 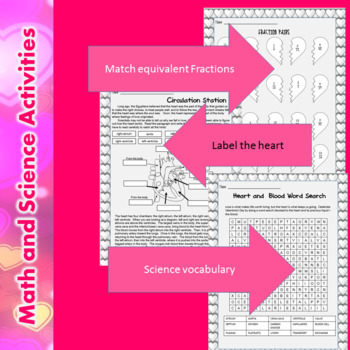 Want other informational texts and activities?